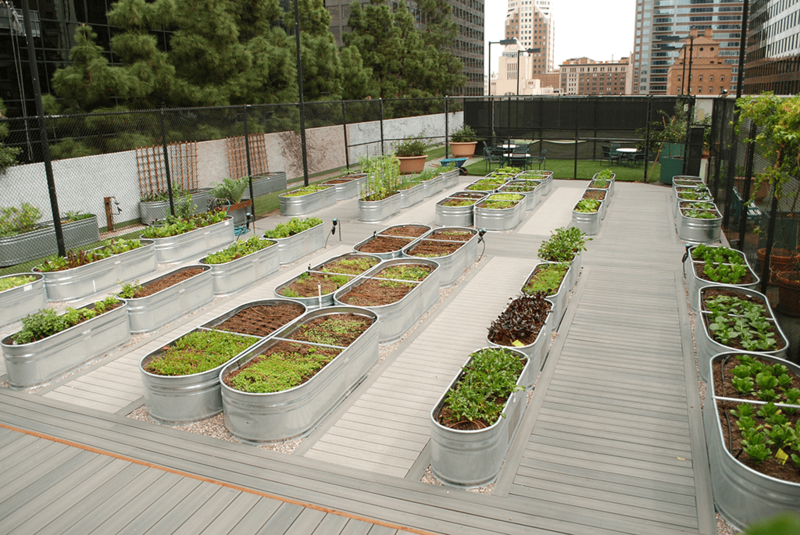 Do you love the thought of growing veggies in your garden, on your terrace or rooftop? I have always wanted to have a veggie garden and I did for the longest time when we lived in the UK. Of course, then it rained a lot which made things grow (a lot). And then I moved to Texas and things stalled, just a bit, like altogether. But I persisted and filled up some pots and attempted to give it a go. So far I’ve harvested 2 beans and a whole bunch of rocket/arugula. But I don’t want to give up on my dream of having a more successful garden. 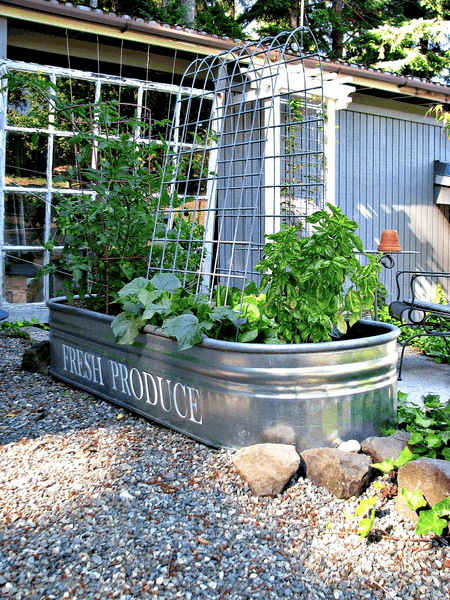 And I just love this idea of troughs or stock feed containers as vegetable planters. I’ve rounded up my most favorite inspiration that I found on the web but I’ve also included this great article below as it does point out some practicalities, as in, be careful of the glare from them! I wouldn’t have thought of that myself. Enjoy reading through and I would love to know which ones you like the most? 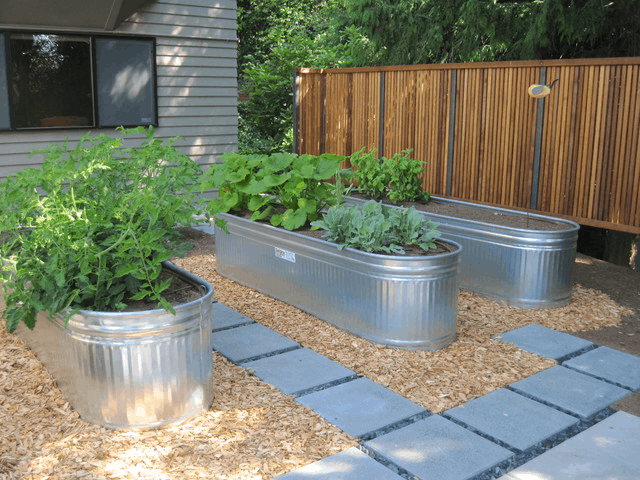 Troughs, also know as stock tanks, make a great and attractive alternative to wooden raised beds. They’re easy to use (no building required!) and cost-wise not a bad investment as they will last forever and keep burrowing animals out. If you pick one 36″ or higher, they’ll also keep bunnies out too. Look for used stock tanks at farm sales or on Craigslist. New stock tanks can be purchased at farm stores or some city garden centers. If you don’t see them where you buy your garden products, ask the manager to special order troughs for you. 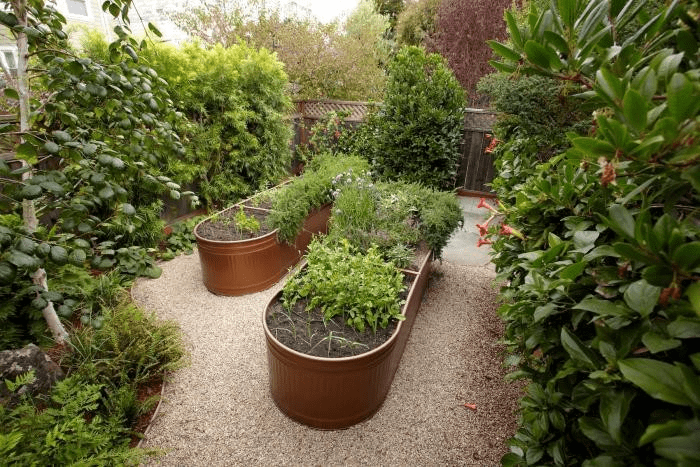 Troughs come in a variety of sizes, shapes and heights and the taller ones provide a great option for those who don’t want to bend down to garden. You can get really creative with stock tanks – they don’t just have to be a single lozenge shaped tank. Use your imagination and have fun with the possibilities! Troughs are heavy so think carefully about where you want to place it. It will be hard to move once filled. You will also want to consider reflection from the sun hitting the metal tough when you’re placing them – they may look lovely out your kitchen window but if the glare is blinding you as you wash the dishes, that’s not a great thing. 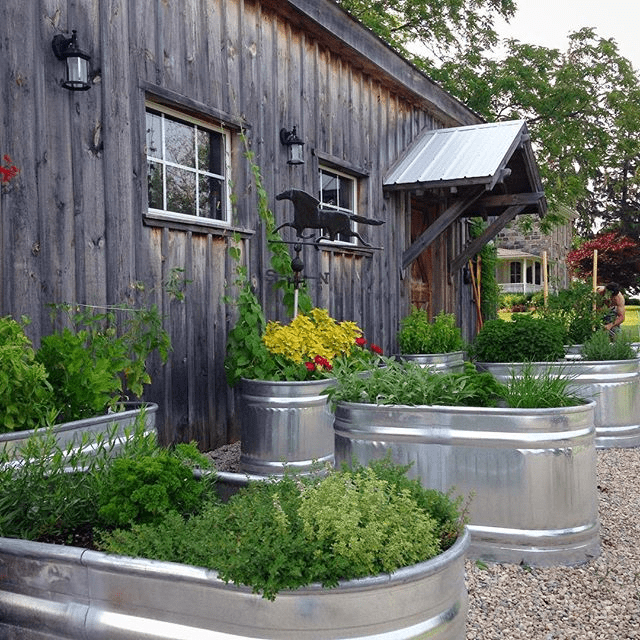 Most of the principles that apply to container planting also apply to troughs. Make sure you have good drainage! You’ll want to drill holes in the bottom of your trough to allow for drainage. You will also want to set your trough on cinder blocks or bricks to allow the water to drain out thoroughly. If you raise the trough to facilitate drainage, make sure you have enough support under the trough so it doesn’t buckle due to the weight. 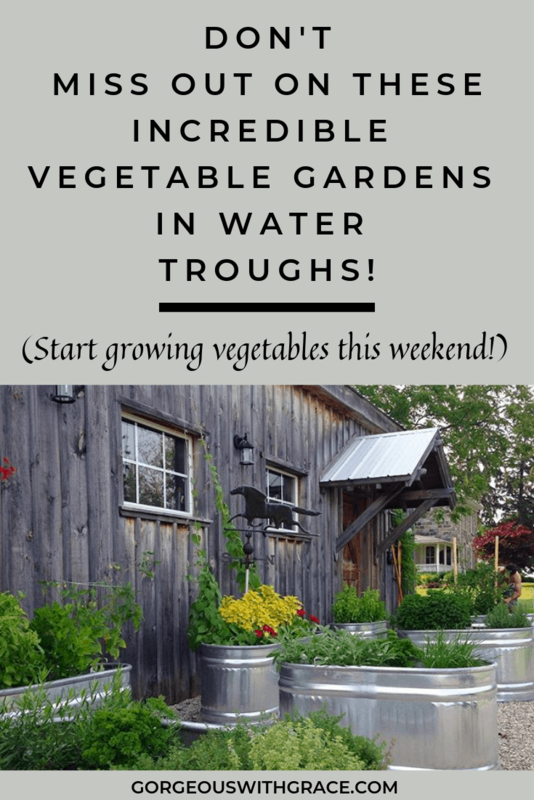 You will want to put 3-6″ of gravel, broken pot shards or other material at the bottom of the trough to help with drainage. You might want to put a fine mesh over the drainage material to keep your soil from slowly leaking out (and potentially clogging drainage holes). 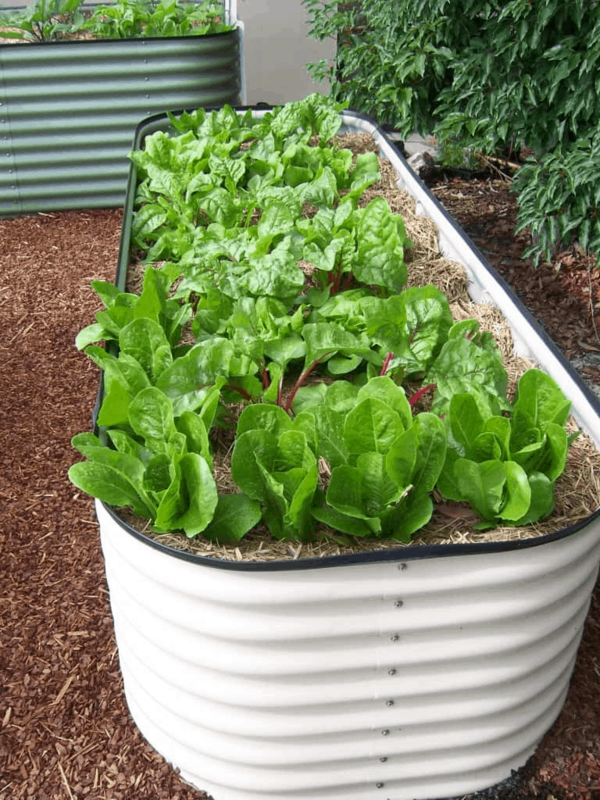 Like other containers, troughs can dry out faster than in ground plantings or raised beds in hot weather. Be sure to check if the trough needs water frequently by putting your fingers into the soil. If you detect moisture 2-3″ down, you’re good. 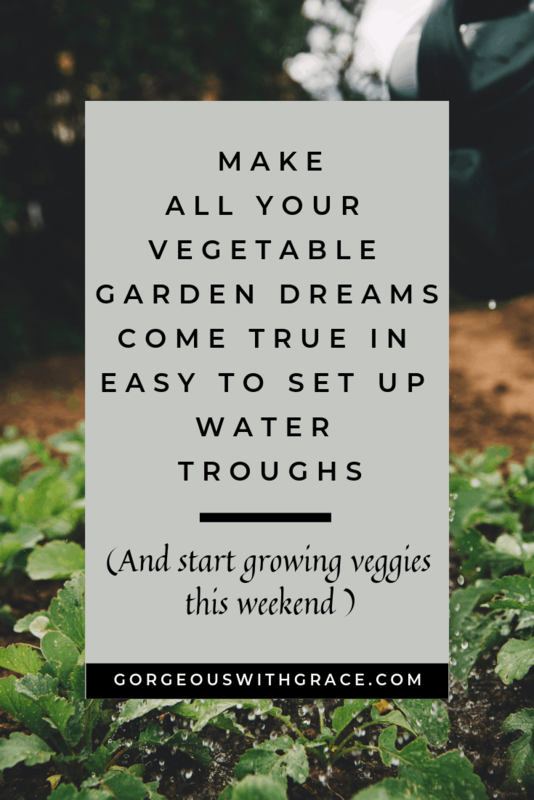 Don’t overcompensate by watering too much. Plants don’t like their roots in soupy soil – it prevents them from “breathing”. Soil rich in compost is great for veggies and works in a trough. Your trough will warm up faster in the spring so you can plant a little earlier. But it will also warm up significantly in the summer so be careful when touching the metal that it isn’t too hot – ouch! “Hot crops” like tomatoes, peppers , and eggplant will most likely love the extra soil warmth a trough will provide. From a decorative perspective, troughs can be painted on the outside to match a color scheme. 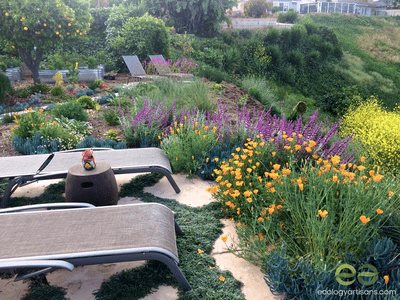 Troughs are great for water gardens too, although different rules apply. 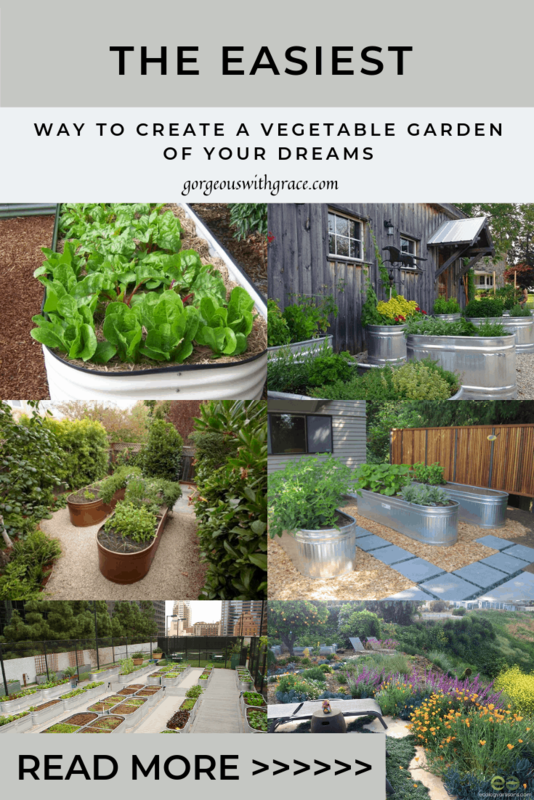 But, consider your through a very large container and come up with all sorts of ideas that suit your particular gardening situation! I love these looks with gravel surround. I love the idea of the pond! 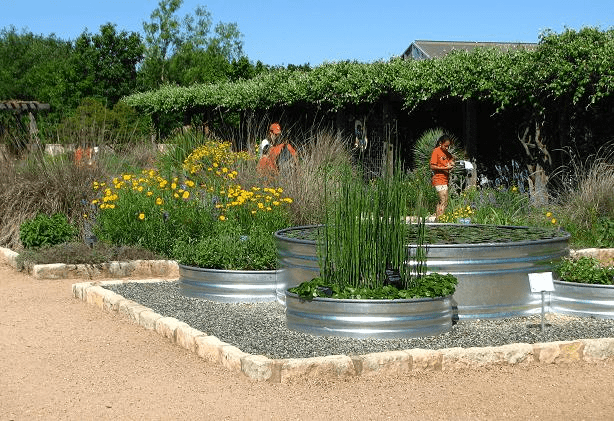 Isn’t this urban farm so incredible! These containers are made with corrugated sheeting too. 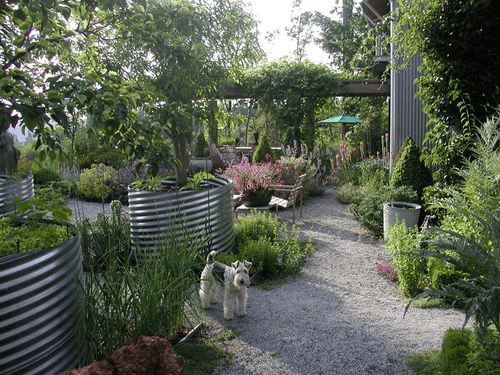 These containers have been included in a beautiful and functional garden design. So blissful. 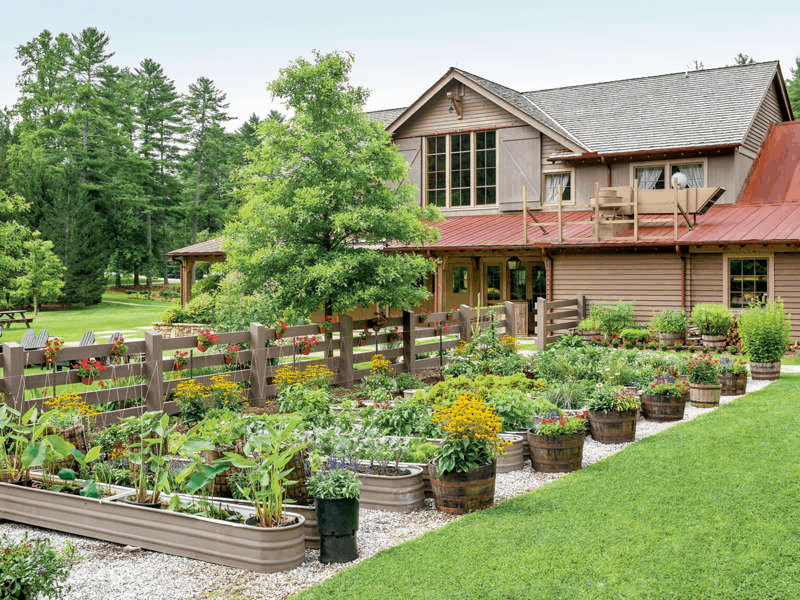 Did you have a favorite and are you inspired to start a veggie garden? I hope so!